We will start palletising our briquettes for Bulk users. Normally they purchase in the spring until early autumn and take pallet loads at a time. This is ideal for people dependent on wood as a fuel source. We put 48 bags on a pallet and each pallet is $250 per pallet for 1-3 pallets, $235 per pallet for 4 or more pallets. Next season the bag price will be increased to $8 per bag for single bags . A lot of people keep asking how do we make them, what do we use? We use a POR briquette press, the dust is extracted from our machines and directly fed to the press. Nothing is added to the dust and chips, just pressure. We only machine solid wood in French Oak, Brush Box, Tasmanian Oak, Jarrah, Walnut and other timbers. We made the carousel to help with the bagging. Wood Briquettes will be sold differently from October the 1st, 2012. To cope with the winter demands we will be increasing the bag price from $6 to $8 per bag in up to 10 bag lots. Our operating costs and machine repairs make this necessary. To compensate for return customers that are becoming dependant we ran a trial over the 2011/2012 summer. In summer we supplied pallet lots of bagged briquettes at $6 per bag. Pallets held 48 bags. Collections were generally on a Saturday once a month. We had a lot of feedback from clients that they preferred this to the bulk bags and they had not deterioration. If you want to go on the Summer bulk list email us with the quantity you need and we will put you on a list. We currently have stock of Wood briquettes and off cuts. 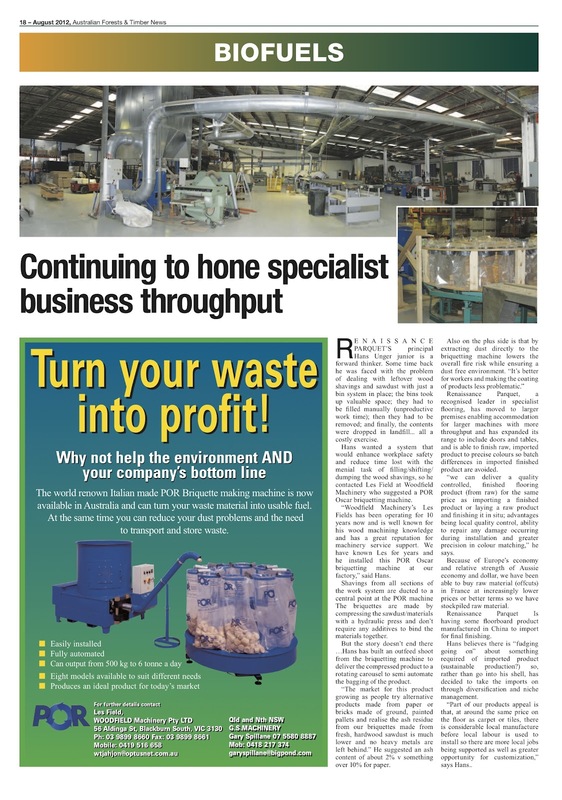 This article featured in the August edition of Forest and timber magazine. I feel this is the only way small to medium manufacturers should operate. Prior to this we spent a lot on waste removal and downtime with bin removals. The POR machine has never broken down over the last 4 years since it was installed.